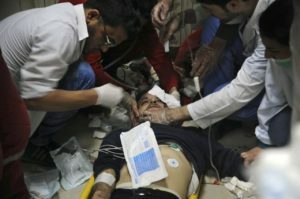 A recent conveniently timed alleged gas attack on a rebel held town of Douma near Damascus in Syria that killed at least 40 and injured scores more raises a lot of questions. The most recent in a string of gas attacks in the rebel held enclave occurred after negotiations for the forced exile of tens of thousands of civilians and rebel fighters had failed. If the alleged Syrian chemical attack play book – fabricate evidence-free claims, have corporate media push the unsubstantiated claims without question , then use the fabricated lies to illegally attack the regime you’re trying to overthrow – sounds familiar, they should. The alleged gas attack came almost a year after the chemical attack perpetrated last year by U.S. trained terrorists failed despite Washington’s best attempts at regime change while trying to frame and remove Syrian President Bashar al-Assad from power, making it imperative to question everything, especially who benefits. The total number of civilian casualties from the alleged attack varies from 40 to 110 depending on which propaganda outlet is pushing the as of yet unconfirmed Psyop reports demonizing Russia, Assad, and in the case of U.S. President Donald J. Trump – former President Barack Obama. The latest attack came at a time when the terrorists supported by the U.S. to overthrow Assad were being beaten badly and, in typical fashion, the attacks were strategically placed in a location full of children and cameras to conveniently capture it all, allowing the sycophantic trumpeters to falsely accuse and rattle war sabers. Despite having no evidence, baseless accusations are coming fast and furious from the U.S. and its corrupt cohorts in the UK to goad an unsuspecting U.S. public into accepting false narratives that make Russia or Assad look guilty. History also has a way of repeating itself as almost a year ago the same exact type of false flag was used to justify Trump’s War Crimes in Syria when he illegally fired more than 50 Tomahawk Missiles to distract for his multitude of self-inflicted quagmires and imploding presidency at home. This entry was posted in In the news and tagged Politics, Syrian False Flags, Syrian Gas Attack, Syrian White Helmets, Trump's War Crimes, Western Propaganda on April 10, 2018 by Bill. 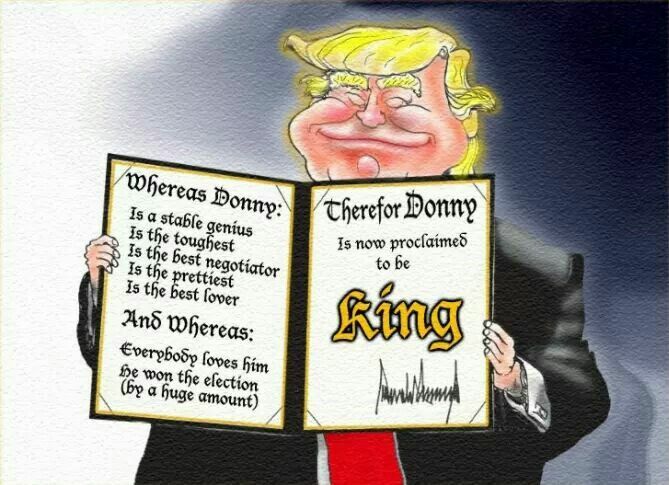 Self Proclaimed King Trump from Pinterest. President* Donald J. Trump has long admired the world’s dictators and often tries to emulate them, but his despotic delusions of grandeur will never come to fruition because he’s too incompetent and corrupt. Ever in awe of other despots, Trump’s despotic disposition was again made evident during what was supposed to be a private meeting during his 100th golfing vacation stay during his first 406 days in office at his Mar-a-Lago resort when he learned that President Xi Jinping of China could stay in power indefinitely if his Communist Party successfully amended its Constitution to end term limits. A leaked audio recording from a private speech to donors after a Pennsylvania campaign rally revealed Trump acknowledging how great he thought Xi’s power play was and being met with raucous applause from his supporters when he lamented about giving that a shot someday. 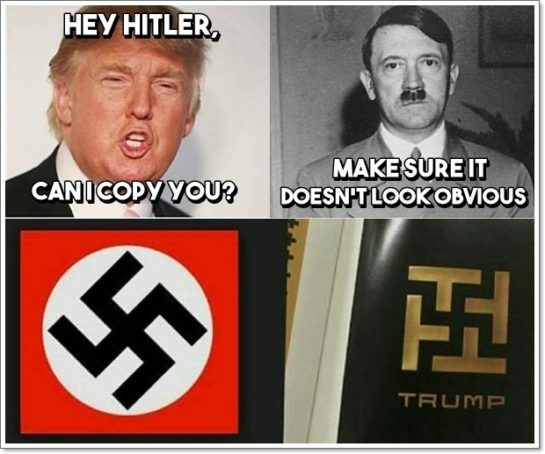 The Donald certainly likes to bully and talk tough while trying to act authoritarian but so far – thanks in no part to the GOP-controlled Congress which keeps trying to cover up his repetitive criminal endeavors – he has been unable to actually become dictatorial because the majority that doesn’t support him as well as the states and the courts have resoundingly resisted him and his initiatives. For Trump, losing the popular vote despite winning the Electoral College nullified the mandate that he erroneously believed he had. Trump’s ‘winning’ the election was totally unexpected for a multitude of reasons, including – but not limited to – lower Democratic voter turnout, disillusionment with America’s corrupt political system and the status quo as well as growing inequality coupled with a foolish minority entrusting a nefarious narcissist who couldn’t care less about them resulted in his victory in the 2016 election being more of a windfall than a mandate. 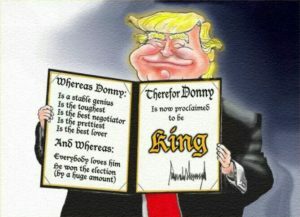 This entry was posted in In the news and tagged Donald's Despotic Delusions of Grandeur, Politics, Popular Vote Losing President, Trump Has No Mandate, Trump's Authoritarian Regime, Trump's GOP Enablers, Trump's Profound Corruption, Trump’s Narcissistic Tendencies, Trump’s Profound Mental Incompetence, Trump’s Totalitarian Regime on April 1, 2018 by Bill. At What Point Does Fabricating Fake News Become Criminal? When CA Republican Rep. Devin Nunes, Chairman of the House Intelligence Committee, and his staff created a fraudulent memo – apparently in collusion with President* Donald J. Trump who has repeatedly obstructed Justice since being ‘elected’ – in efforts to ‘vindicate’ Trump in his ongoing Russia scandal and put an end to it while trying to provide cover for Trump to fire the Director of the FBI, it raises a lot of questions. Nunes – who has since started his own fake news site – started leaking information on his ‘memo’ to Fox faux news who in turn ‘reported’ about it while trying to create a scandal that didn’t exist and pushed for the release of it, aided by millions of bots that are alleged to be of Russian origin that promulgated their fake news on Twitter, Facebook and a host of other right-wing ‘News’ sites and social media platforms to try and deflect from Trump’s failed attempts to shut down the multitude of scandals currently burning down the walls of his imploding White House. Nunes’ attempts to help Trump backfired spectacularly. But the depths of unbridled idiocies from Trump and Nunes didn’t stop there. Unsatisfied with one round of fake news over the dud he called a memo, despite the continuing fallout from it, Nunes created two more fake news stories that have also been repeatedly proved as nothing but fraudulent attempts to exonerate his leader. So far Trump and his propagandists are 0-for-3 in trying to kill investigations into his ongoing Russia scandal, but Nunes has hinted that he may have 5 more memos to release. It’s unknown if Trump ever colluded with Russia to be elected, but his many Obstructions of Justice are glaringly evident. This entry was posted in In the news and tagged Devin Nunes, Politics, President* Donald J. Trump, Trump's GOP Enablers, Trump's Profound Corruption, Trump’s Failing Presidency on February 25, 2018 by Bill. In their unrelenting contempt for the general population, it has become glaringly evident over the course of this past decade that the U.S. Congress has become so rife with corruption — the best government that money can buy if you lobby for a large corporation — and complete disdain for the oaths they swear to upon taking office, that America has been sold out. Despite having about 1,500 fewer registered lobbyists in town this year, last year’s record of $3.3 billion dollars that was spent lobbying Congress and the rest of the federal government is reportedly on track to be shattered according to data collected by the Center for Responsive Politics. Main Street continues losing jobs while seeing little if any evidence of the economic revival the ‘experts’ continue eluding to while K Street continues raking it in. Despite his pledge to reign in lobbyists and the influence they possess in Washington, many lobbying firms escaped the worst of the economic crisis thanks to President Obama’s massive economic stimulus package that he kicked off his Presidency with. Traditional big spenders like the real estate and telecommunications sectors, as with many other sectors, cut down on the amount of money they gave to K Street but legislation on health reform, financial reform and climate change has made up for K Street’s lost compensation during these challenging economic times. This entry was posted in In the news and tagged Civil Liberties, Corruption, Deception, Fraud, Lobbying, Politics on December 28, 2009 by Bill.